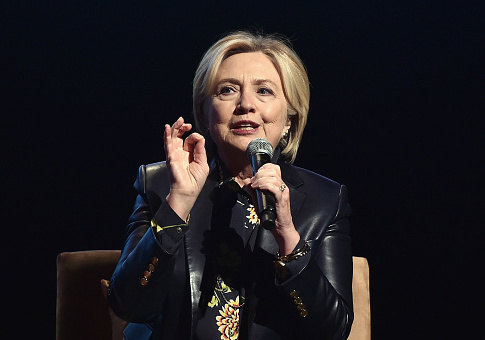 Two-time failed presidential candidate Hillary Clinton said Monday that she intends to continue fighting for women's rights and to "remain on the front lines of democracy," despite her 2016 election loss to President Donald Trump. "Advancing the rights, opportunities, and full participation of women and girls is the great unfinished business of the 21st century," Clinton told students at Georgetown University in Washington D.C. "I intend to keep fighting to pursue this agenda and remain on the front lines of democracy." Clinton appeared at the Georgetown Institute for Women, Peace, and Security to give a speech, participate in a panel discussion, and present the 2018 Hillary Rodham Clinton awards to individuals who advance women's role in creating a more peaceful and secure world. The former secretary of state presented the human rights awards to Nadia Murad, a former Islamic State captive, and Wai Wai Nu, a Rohingya activist and former political prisoner from Myanmar, and also gave a special Global Trailblazer Award to BBC chief international correspondent Lyse Doucet. Clinton praised the three recipients and commended their work. She said that Murad represents a powerful rejection of what ISIS stands for through her work against human trafficking and that Nu, who works for democratic reforms and human rights, helps others understand the internal strife in Myanmar. Clinton praised Doucet's reporting on the experiences of women and children in conflict zones, calling her stories "absolutely essential." The 2016 Democratic presidential nominee added that the work of journalists is crucial when "expertise, truth, and facts are under siege." "I still believe in truth, evidence, facts," Clinton said in an implicit shot at the Trump administration. "There is no such thing as alternative reality, and we have to make sure that we don't try to live in it or let anybody else push us to live in it either." The former secretary of state added that she gets "overwhelmed at least a dozen times a day" by news about events across the world. The "steady drumbeat of women speaking out about their experiences has never been stronger," Clinton also said, describing the wave of sexual assault and harassment survivors coming forward as a "watershed moment." She mentioned harassment, reproductive rights, and pay disparity as major issues that women face in America. But Clinton also discussed other issues, like climate change, which she argued during the panel discussion, led by Doucet, would primarily affect women. "So yes, women once again will be primarily burdened with the problems of climate change," she said. "So look for international organizations to support." Clinton blasted Trump's intent to withdraw from the Paris climate accord and said "there needs to be more political pressure put on the current administration to get back into the [agreement]." She encouraged the crowd, comprised mostly of students, to be active in calling members of Congress on the issue. During her remarks, Clinton mentioned her 2016 election memoir, What Happened, and argued that "misogyny" and "sexism" contributed to her loss to Trump. "Any of you who've read my book about ‘what happened' know that I think misogyny and sexism was part of that campaign—it was one of the contributing factors," Clinton said. "Some of it was old-fashioned sexism and the refusal to accept the equality of women, and certainly the equality of women's leadership." Clinton said the best way to push for women's equality is to vote. "Certainly, voting remains the principal way that every individual can express an opinion," Clinton told the audience. "And anyone who chooses not to vote, basically leaves that opinion to others and perhaps don't hold your values." "We are not going back and woman's voices are not shutting up," she said. This entry was posted in Politics and tagged Georgetown, Hillary Clinton, Paris Climate Accords, Women. Bookmark the permalink.